Joy Abundance Glass. Bach flower remedies, A.Vogel herbal, homeopathic and other wellbeing products from Alby, Cromer, Norfolk. Citrine energises every level of life. In crystal healing traditions, it is used to open the chakras and sharpen the intuition. The energy of this stone is alive and overflowing, full of joy, wonder, delight and enthusiasm. It is believed to motivate, activate creativity and raise self-esteem, thus opening a world of abundance! 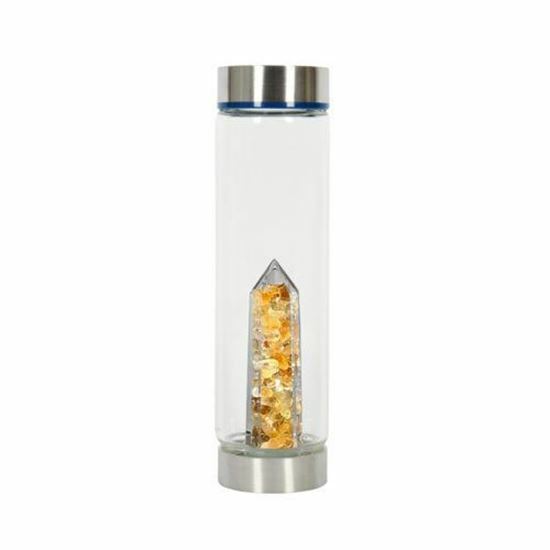 From a physical perspective, Citrine is all about balance – balancing hormones, settling digestion, improving circulation and supporting thyroid function. It is a great stone for detoxification of mind, body and spirit; and for a time of renewal and creation! The gemstones need no specific cleaning or care. (Individual users may choose to charge the stones according to one of many traditions) The bottle can be hand washed with warm soapy water and well-rinsed. How do I use my bottle? Studies have shown that the change to the water molecules made by gemstones happens in around seven minutes. Fill your bottle with whatever water you choose to drink, leave it in the bottle for approximately ten minutes and then enjoy! The gemstones dont't touch the water - how does this work? The energy from the gemstones charges the water regardless of the barrier. This has long been a tradition of gemstone water as certain stones are toxic to put directly into your drinking water. Are the gemstones real or synthetic? All of our gemstones are genuine, A-grade natural stones and ethically sourced.